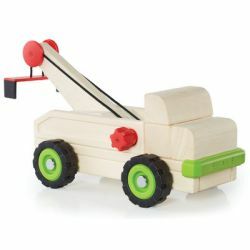 Large wooden toy tow truck (beech wood) with plastic parts teaches children about simple machines: the wheel and axel. Designed so that Unit Blocks can be placed inside the piece attached to the crane–Unit Blocks not included. 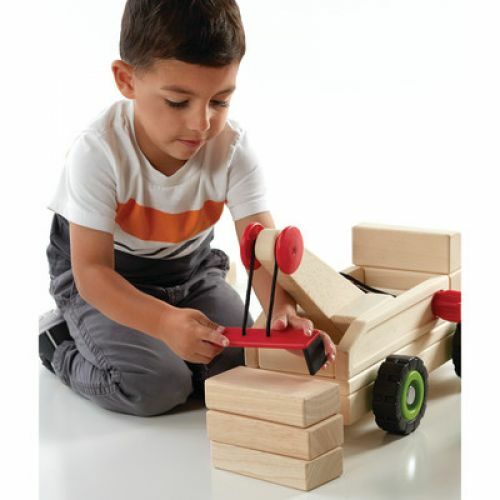 When a child rotates the handles in the front of the truck bed, the attached Unit Blocks can be raised and then lowered. Educational benefits: Spatial reasoning, early engineering concepts and the mechanics of simple machines, social-emotional benefits including cooperation, sharing, language and self-expression.